MOSCOW, April 12. /TASS/. 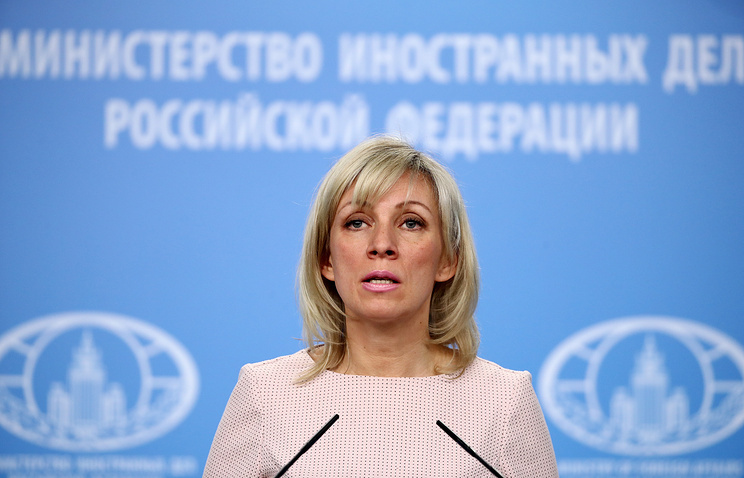 Threatening Syria with the use of force blatantly violates the United Nations Charter, Russian Foreign Ministry Spokeswoman Maria Zakharova said on Thursday. "The threat to use force against a UN member state is, in itself, a blatant violation of the organization’s charter," she said. "This is the organization the US ambassador to the United Nations has been so active in, thus confirming its legitimacy," Zakharova added. "Given the statements we’ve been hearing from the US ambassador, we would like to have an answer to the following question: Will a threat to use force against a sovereign state be legitimate? To say nothing of how far Syria has come in the fight against international terrorism, struggling to protect its sovereignty," Zakharova noted. Radical insurgent groups are determined to derail the peace process in Syria and are prepared to resort to extreme measures, she added. "The extremists have stepped up their activities amid the backdrop of achievements reached through negotiation procedures to resolve the situation in Eastern Ghouta, which have made it possible to save thousands of ordinary Syrians’ lives. They are obviously not interested in such a solution. Their sponsors, who, as experience shows, are ready for extreme steps to carry out their interests in Syria and who have nothing to do with the genuine interests of the Syrian people, have become more active as well," she said. According to Zakharova, accusations against Syrian government troops of the alleged chemical attack in Syria’s Douma are an attempt to undermine the peace process in the war-torn country. Russia regards the World Health Organization’s statement on Syria’s Douma as misinformation fanning tensions in the country, Zakharova said. "We regard the WHO statement as an instance of irresponsible dissemination of groundless misinformation, which incites those eager to foment the intra-Syrian conflict into taking more aggressive action," she said. "We urge the WHO to be more impartial and rely not on biased, repeatedly discredited sources in drafting its reports and statements, but on the opinion of experts capable of making the corresponding conclusions after fundamental research," Zakharova said. Israeli air force’s missile strikes on the Syrian military air base T-4 in the Homs province were coincident with terrorists’ intensified activities in that region, she said. "The situation in Syria has not gained stability after a strike on the Syrian airbase 70 kilometers west of Palmyra by Israel’s air force in early hours of April 9," the diplomat said. "It is noteworthy that the attack on T-4, the deployment location of the combat aircraft directly engaged in the operation against ISIS (the former name of the Islamic State terrorist group outlawed in Russia - TASS), was coincident with a surge in diehard terrorists’ activities." On Monday, US President Donald Trump said that Washington had "a lot of options militarily" on Syria in light of the alleged Douma chemical weapon incident. A number of non-government organizations (NGOs), including the infamous White Helmets, spread allegations about a chemical weapons attack in Douma on April 7. The Russian Foreign Ministry slammed those allegations as fake news reports, while Russia’s Defense Ministry pointed out that the White Helmets were not a reliable source of information since they are notorious for disseminating falsified material.